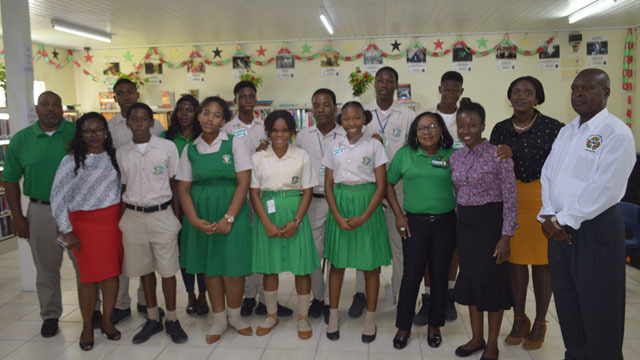 Students of the Cayon High School, who are members of the school’s environmental club were on Monday guided on becoming litter wardens by staffers of the St. Kitts Solid Waste Management Corporation (SWMC). The students will be required to function as litter wardens on campus and even devise their own rules for enforcement. Mr. Randolph Browne, Supervisor of Enforcement, spoke to the students on segments of the legislation that governs littering and that empowers litter wardens to administer their duties. “The students were hungry for such a training of this kind and to my mind it went down quite well. They were very attentive, they asked questions, they get answers and were satisfied from what I observed,” he said. Minister in charge of the SWMC Eugene Hamilton, also addressed the students on the importance of the work of the SWMC. “As simple as you see that task and as unimportant as you may think that task is, keeping the place dirty affects the entire country,” the minister told the students. One of the teachers involved with the environmental club, Dr. Josephine Ekong spoke about the workshop. “We had the Solid Waste Management officials and some litter wardens here to train the students on being good patriotic citizens by trying to reduce waste in our society,” Dr. Ekong said. Presently the environmental club purchased some blue garbage bins. These bins will be put in proper use because presently the Solid Waste Management have come to train the students and now that the bins are available, we will be able to sort out the plastic and Styrofoam. We believe the environment will be clean,” she added. Meanwhile, Allese Clark a member of the environmental club, spoke about the club’s origins. “It all began when we were learning a topic on the environment and our teacher decided we should have an environmental club,” she said. “This started because we felt that our school should be cleaner and the student should learn more about the environment and how it can affect us,” the student added. Another student Jelani Griffin, who attended Monday’s workshop spoke on why he is attracted to become a litter warden on campus. “I like the idea of the litter warden. I feel it’s a good thing because it (involves) people’s life and we need to keep healthy and it’s very important to keep our surroundings clean,” he said. Meanwhile, Tyasha Henry, Collections Officer at the SWMC, expressed satisfaction with the outcome of the Monday’s workshop. “I think that this project has been going on for a while and the students are learning more about garbage, PET bottles and what steps they can take. Moving forward I think that the kids had a good opportunity in learning and we hope that this assistance will help them to move forward,” Henry said. Ms. Henry has been spearheading a project of the SWMC to promote the separation of waste and recycling of PET bottles at the island’s schools. She was inspired to do this after returning from a training in Japan two years ago and has enlisted several primary and high schools in St. Kitts thus far. The Cayon High School had already began its own recycling program prior to the SWMC’s introduction and recently acquired some blue bins especially for the disposal of plastic bottles. The bins were purchased through funding from the Global Environment Facility (GEF).